The weathers been fabulous this bank holiday weekend, and…I have a tan!! A bloody good job, too, as I accidentally bought the wrong hair dye, and now have BLACK hair! Yes, Morticia lives. So without the tan, I would have looked rather washed out. These little accidents often happen to me. My family affectionately refer to them as, ‘Belleisms’. And believe me, there have been quite a few Belleisms over the 28-year stretch of my life. I was hot. I was irritable. And I was in the worst place in the world on a hot day: the supermarket. Hoards of people flock to these places the minute the sun decides to peek around from the clouds. We English, we love a bit of sun, which is apparent the moment it appears – regardless of whether the sunshine is actually HOT, we strip to our shorts and t-shirts, push down the roof of the convertible (not that I own one. Not that I own ANY type of vehicle for that matter), and stampede the supermarkets for BBQ food while our lilly-white skin turns a rather unattractive shade of red. So of course, with my patience getting thinner and thinner as I am pushed around, cut in front of, and my ears are abused by the wailing sound of spoilt brats begging for an ice-cream they are told will not be bought today, I rush to the appropriate aisle, grab the usual box of dye, and head for the checkout. I get home, make a cuppa, try to find the energy to die my hair, and then discover I have bought the wrong colour in my haste to leave the shop. Damn. I have to die it anyway, so I figure ‘what the hell’, and voila, I look like a character from the ‘Adams Family’. This one is also quite recent. I have an obsession with eyebrows. I was unfortunately born with both my parents eyebrows – thick, bushy, and apparently trying to take over my entire face. Not attractive. My younger sister, however, did not inherit such eyebrows, and grew up with naturally beautifully formed eyebrows. I was insane with jealously. You see, my younger sister was apparently born with ALL the good genes: great legs, height, natural popularity, and AMAZING eyebrows. And as we were not too far apart in age, we shared a room. So I spent my entire youth having to look at these perfect features while my own fuzzy brows grew into an untameable mess; I never grew taller, and my legs remained skinner than a couple of cocktail sticks. Sickening. 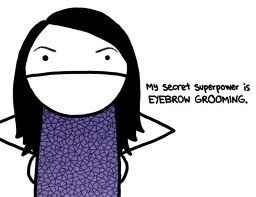 So the eyebrow obsession grew, and as I got older, I learned to pluck. But I still find myself fascinated by other womens eyebrows. I was sat on my sofa the other day, watching a U-tube video on ‘smoky eye’ makeup application, when I stumbled across one for eyebrows! Imagine my elation!! So I watched, watched again, and then took myself upstairs to get my tweezers and little nails scissors, and went to work at creating perfectly formed eyebrows. Later that evening, I had a bath, and as I got out I caught a reflection of myself in the bathroom mirror. “What the..? !” went through my mind. I stared hard at the reflection of my face in the mirror: WHERE THE F*! @ING HELL ARE MY EYEBROWS?! It was only then, as the realisation dawned that I no longer had any eyebrows (save for a few stay hairs), that I had plucked my eyebrows earlier while wearing EYEBROW PENCIL! I had completely forgotten that it had been applied earlier that morning, and had plucked and trimmed assuming the dark line was hair! Douchbag doesn’t even cover it. This one goes back a few years, when I was about eighteen. I worked in a building very close to the supermarket my mum works at, and so after work I decided to nip in, grab some bits for my dinner, and say hi to my mum before I went back to my flat. I’d chosen a short skirt suit that day, and in my eighteen-year-old mind, thought I looked fabulous (I was young and a tad self-obsessed). I grabbed a trolly (cart) and strutted my way around the shop, pretty chuffed with the looks people were giving me (even if they did seem a little odd…) I lapped up the attention, and filled my trolly with dinner. This particular trolly was weird though; it seemed to have a metal flap I needed to lift in order to place my items in. Strange. Must be a new trolly, I though to myself. Though couldn’t understand the purpose – to save goods being stolen from your trolly prior to purchase? Pretty dumb, if you ask me. However, I continued. I found my mum on a checkout with quite a large queue of people. Still, I wanted to see her, so remained in the queue. After a while, following a few more looks from people (DAMN I must look hot today! ), it eventually became my turn – a huge queue of people had now formed behind me. I lifted the ‘lid’ of my trolly, and began to place the items on the conveyor belt, and causally mentioned to my mum that I didn’t think much of these new trollies. Everyone in the queue behind looked at me. “These ones, with the stupid lid,” I replied for all to hear. Mum looked over the counter to look at said new trolly. Not as hot as I thought, after all. Just bloody stupid! I had moved into my new flat with my boyfriend. I was SUPER excited, as it was the first flat I had ever owned, and as we unpacked our belongings, I was overwhelmed by excitement; everything was BRILLIANT in my eyes. We moved to the kitchen, and started to find homes for things, when I looked at the little electric cooker (which came with the flat). I soon discovered the ‘lid’ lifted, taking the rings up with it, leaving a bare, flat surface. “AN INDOOR BARBECUE!” I squealed in delight, again SUPER excited! What an amazing thing to have! My boyfriend at the time fell to the floor in fits of laughter.